Here comes another in the series of wedding trips, I have been on for some time now. This one although sixth and probably last for the season (as per my invitation chart right now), was exciting and awaited. We have a huge list of friends and in this age of social media the list is simply endless with many known and some unknown friends too. However there is something different about the college buddies – people you have spent over 4 years, shared all your happy and sad moments, celebrated festivals, fought over small things, attended lectures, bunked classes, competed in various fests and cared for through the journey of becoming a graduate. This trip was for one of such friend and hence it should be easy to realize the importance of the occasions. I was looking forward to the event from the day, a couple of months ago, when Loki called me to break the news and extend the invitation. As planned, I started the journey from Delhi to Jaipur on Ajmer Shatabdi early on Saturday morning (16th of Feb). Catching an early morning train which needed bidding goodbyes to the lovely sleep at 5 in morning can be unbearably painful. However, I did overcome the suffering and there I was enjoying my breakfast in this so-called premier train of Indian Railways. As many of you may have read with my earlier tryst with delays of Indian Railways, this train running about an hour behind schedule did not pinch too much. By noon, I was there in the pink city – Jaipur - my supposedly home-town, after about half a decade. Most, if not every, thing seemed to have changed almost like the advertisements of one of the leading political parties. I was received at the station by a colleague of dad and was escorted, amidst luxury, to the guest house where I had my accommodation booked. After a short break and freshening up, I was all geared to be active. The engagement ceremony was during the evening and I had a few hours to kill before that. So I stepped out of the guest house and decided to take a trip around the city. Then I realized, for a trip, you need a destination. Well mom came to help out there. She had some errands to run and pick some stuff up and hence the shop became my destination. I took an auto, which either had become real costly or good at duping people, for my destination, Nirman Nagar, an area which I knew to be towards outskirts of the city. The city really had changed and expanded – there were multi-lanes roads, dividers to separate traffic in different directions, flyovers to by-pass railway crossings, malls in sight, bigger eating joints, huge load of traffic and of all Nirman Nagar was no longer outskirts. I reached the shop and realized that stuff to be collected wasn’t yet ready. Though it could be termed as a waste, my purpose was being fulfilled. Next destination I chose was the National Handloom – a small mall – in Vaishali Nagar. Purpose again was the same – to see the city to which I had been back after considerable time. After spending some time at the mall, I returned back to my guesthouse. I dressed up quickly into some formal wear for the evening ceremony and was ready again to leave. I had already talked to the auto guy from one of the visits earlier in the day to pick me up at 4. At the said time the guy was there in front of the guesthouse and took me to the venue – Rupayan Marriage Home in an area called Jhotwara. Well delays seem to be inherent in culture and imbibed in our genes and hence the ceremony scheduled at 5 finally happened at 7. However, in the meanwhile, there were snacks to feed and DJ to entertain. There also was a dance floor which provided an opportunity to shake our legs. We danced and ate and killed time until about 6:45 when the bride arrived and stage was set for the ceremony. The bride and groom exchanged the rings which were nicely placed inside rose shaped containers. These containers when exchanged brought smiles on faces as they replicated the sense of exchanging the flower itself. Following the ring ceremony was the program called Mahila Sangeet. Traditionally, ladies of the house gathered and sang songs in celebration of the marriage. However, nowadays in most marriages we have dancing and singing by professionals who are specially engaged for the purpose. This marriage however was more traditional in nature as it was the members from the family of groom and bride who had prepared dance numbers for the occasion. There performed one after other, each bringing in a different flavor and emotion. One of the emotional performances was from the brother of bride who danced to a medley of songs depicting the theme of brother-sister relations. Well the mischievous me within myself was woken up at this moment and started pushing the groom (I hardly had any right to push the bride I guess!!) to jump to the dance floor of course along with the bride. The hesitant and unprepared groom was obviously not easily convinced and needed a nudge from his mom (which I arranged for). And so they dances, the groom Lokesh and bride Malvika to tunes of a couple of songs and the crowd roared, cheered and clapped. This was followed by a dinner for the couple along with close friends and thus ended the ceremonies for the day. One of Loki’s friends, Dev dropped me back to the guesthouse for the night. Next morning, I again had some free time as the wedding related activities were supposed to start post lunch. So I took my time to wake up and started the morning pretty late partly to compensate for previous morning. Once, I was in my senses, the caretaker of the guest house treated me to a breakfast of hot aaloo parathas and tea. After that I readied myself reluctantly to go out and meet a few of my old friends and we roamed around the city for some time before having lunch thali at one of the famous restaurants in the city – popularly called as – LMB. I returned back to the guesthouse and freshened up. Today was a traditional day for me and hence I put on my brand new Kurta Payjamas. 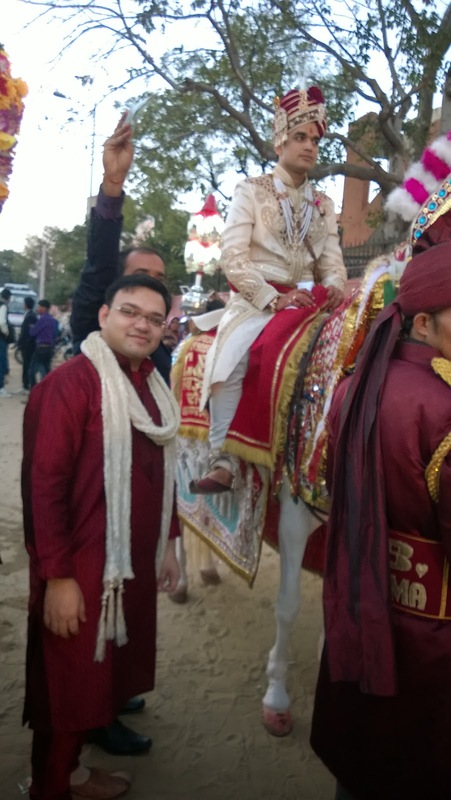 I then met Goverdhan and we reached the starting point of Baraat together. For the uninitiated, Baraat is a tradition in Indian Hindu marriages, where the grooms friends, relatives and known-ones gather and move to the brides place (or the marriage venue) in form of a procession. It involves drums, loud music and lots of dancing while the groom rides a horse with the procession. Here the baraat was being led by two elephants, followed by the generator sets and music systems loaded on a jeep, drummers, dancing troupe of friends and then the groom himself. We started at around 6 PM and reached the wedding venue by 8. 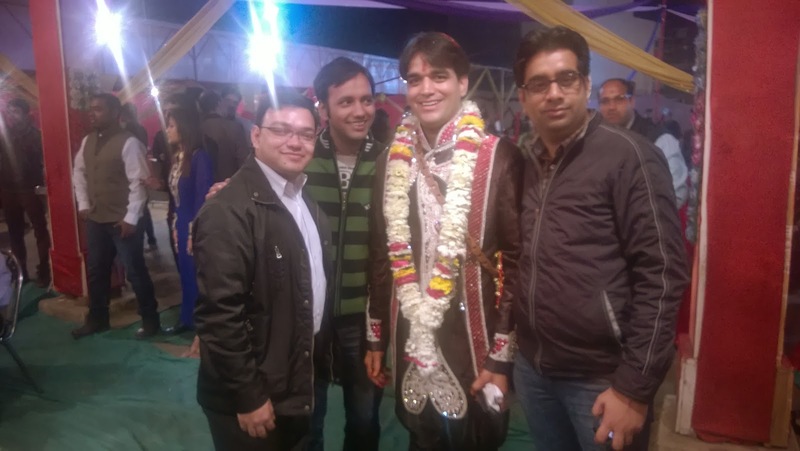 Once the groom was there at the venue, it followed the arrival of the bride in palki. 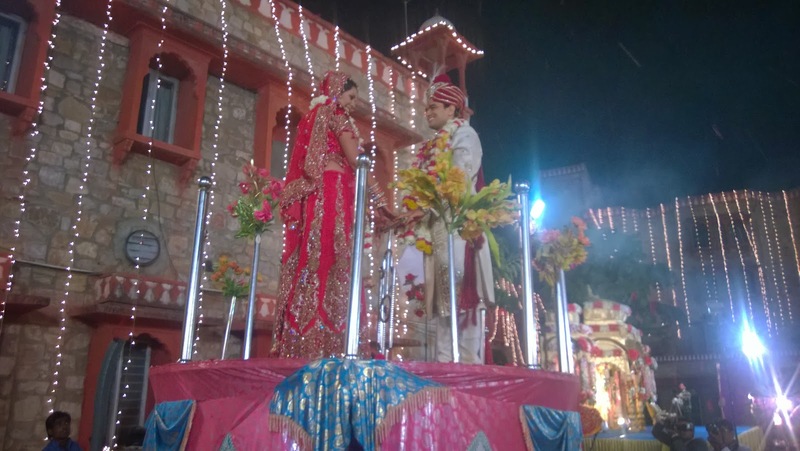 Both of them then climbed a specially designed stage which rotated with music during the varmala (exchange of floral garlands between the couple) ceremony. 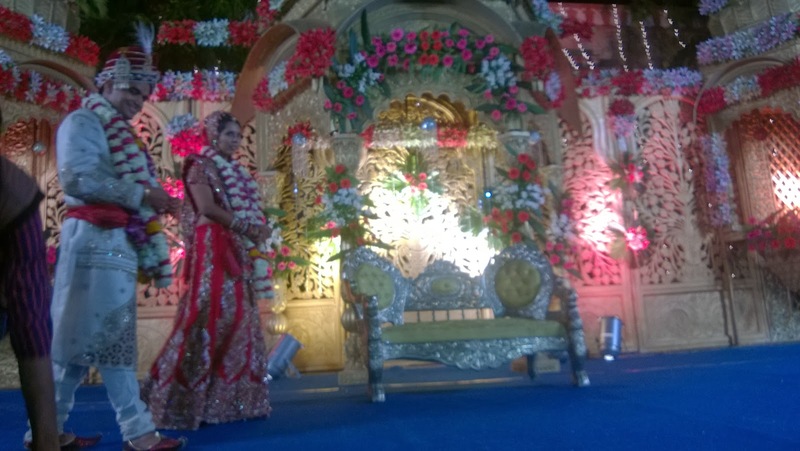 Then the couple moved to a different stage beautifully decorated with flowers and lights where guests wished the couple and posed for photographs. Meanwhile we were busy trying out the sumptuous spread of snacks, starters, soups and chats. Once the photo-sessions were over, the couple moved to the dinner table, again with us to provide company and have another round of dinner for ourselves. Marriage ceremonies have a special way of creating illusion – you try and explain yourselves that eating to the fullest is your right at friends marriage and the guilt is further subdued by realization that you have just danced for over two hours. Later after the dinner, the couple proceeded to the mandap (spiritual place) for the pheras, a tradition where the couple circumambulate around a small fire seven times each signifying a lifetime of togetherness. However, as the couple moved towards it, it was time for me to bid goodbyes as I had my train back home in another hour. So, I wished Loki and Malvika one last time, extended them invite to visit home once they are back to Delhi and took leave. I met several of Lokesh’s relatives, Goverdhan, Atul and Dev before leaving the venue. I boarded the Mandore Express back to Delhi at 1 in night and was back in Delhi by 7 in morning. While on my way back from station to home, I was greeted by the morning sun – bright red and fresh – and it was a lovely sight which is a rare occurrence mostly because I seldom am awake that early in the day.